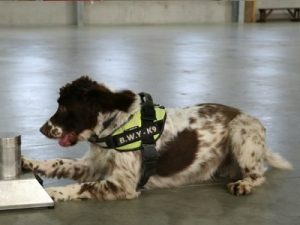 Sniffer dog Scamp, who helped Trading Standards officers in the South East during a series of illegal tobacco searches last year, has become such a threat to criminal gangs that a price has been placed on his head, it has emerged. A sniffer dog who has taken part in a series of Trading Standards inspections has had a £25,000 bounty placed on his head by organised crime gangs. Springer spaniel Scamp assisted in a project involving seven local authorities in the South East between October 30 and November 29 last year. The initiative, organised by Trading Standards South East (TSSE), targeted self-storage facilities in the region that were suspected of being used to store illegal tobacco. A total of 18 premises were visited, with one of the local authorities checking more than 1,400 storage lockers in just one day. With Scamp’s help, some 429,700 cigarettes and 189kg of hand rolling tobacco were seized, with a total street value of approximately £137,000. Scamp is owned by Wales-based BWY Canine Ltd, a specialist detection dog company that works with Trading Standards teams across the country. The company’s managing director Stuart Phillips has revealed that as a result of sniffing out more than £6m worth of tobacco and £60,000 worth of cash over the past five years, Scamp has become such a thorn in the side of criminals that there is a price on his head. “We had to stop working in one part of the country last year, because there was a £25,000 bounty put on his head,” Phillips told anti-smoking charity ASH Wales. The Local Authorities that took part in the TSSE project last year were Brighton, East Sussex, Kent, Oxfordshire, Portsmouth, Southampton and West Sussex Trading Standards Services. Lead Trading Standards Officer for the project Matthew Golledge said: “Due to emerging intelligence we expanded our Trading Standards enforcement to cover alternative storage locations to disrupt and take action against those who are supplying illicit tobacco in the South East of England. Current finds are being investigated and further visits are being planned”. In addition to the tobacco seizures, evidence of a potential tobacco packaging factory were also uncovered, with 15,000 empty 50g pouches of hand rolling tobacco identified alongside 15,000 counterfeit duty stamps. Approximately 4,000 A3 sheets of outer wholesale packaging were also seized from the same unit. The products were produced in unlicensed and uninspected premises. Another outcome of the search was the identification and seizure of multi-kilo quantities of Class A drugs and multi-kilo quantities of cannabis with a street value well in excess of £100,000. The illegal tobacco trade has strong links with organised crime and criminal gangs; many of the people smuggling, distributing and selling illegal tobacco are involved in drug dealing, money laundering, people trafficking and even terrorism.